If you own a Kinect-compatible title right now, you may want to resist the urge to play it. Imagine this scenario: Your little sister has been waiting for Kinectimals ever since it was first revealed by Microsoft. She's so fired up that when it's accidentally shipped to your house early, she puts it in the Xbox 360 and tries to play even though Kinect itself won't be released for another week. Seems harmless, right? Sure, if you don't want to play Xbox Live for a week. Even if you somehow own Kinect and a Kinect game already, putting the disc in your Xbox 360 could restrict your access to Xbox Live. Attempting to play a Kinect game at the current time will prompt your Xbox 360 console for an update. If you hit "continue," it will download an update that isn't an actual update, repeatedly fail at downloading another update, and lock you out from being able to sign in to Xbox Live until the true Kinect update goes live on November 4. In other words, no Halo: Reach multiplayer for a week. I wouldn't feel as bad for the people currently putting Kinectimals in their Xbox 360's if they were actual pirates, thieves, or any other kind of unsavory character. In this case, retailers have actually been shipping out copies of the game early, which could lead to a tough situation that is in no way the average consumer's fault. At least it's just a week, and probably not a very common situation. If this happens to you, it might be time to fire up the PS3, Wii, DSi, PSP, or PC. 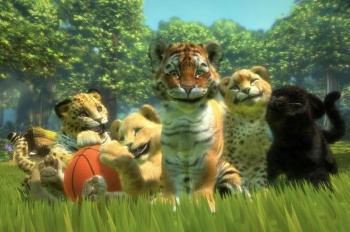 But hey, once Kinect does eventually go live, you'll be able to pet the hell out of a virtual feline cub to your heart's delight. Just try to not let the overwhelming desire to do so shut down your, or your family's, online experiences for now.